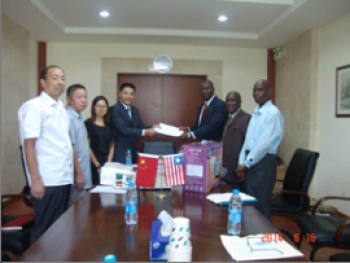 The Chinese Embassy near Monrovia on Monday, June 16, 2014 donated several Ebola medical equipments to the John F. Kennedy (JFK) Hospital in Monrovia and the Jackson F. Doe (JFD) Hospital in Tappita, Nimba County. The equipments will be used by the Chinese medical teams at both hospitals. Deputy Foreign Minister for International Cooperation Elias Shoniyin received the donated medical equipments on behalf of the Liberian Government which include respirators, precision infusions, disposable surgical gowns, protective clothing, single-use sterile rubbers, hand sanitizers, first-aid kits, bedside monitors and UV light. The donation of the asserted medical equipments comes in the wake of renewed suspected and confirmed cases of Ebola in Liberia that have claimed over five lives in recent days.